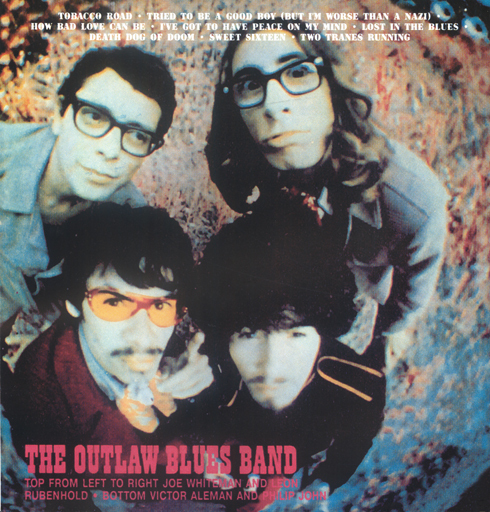 1967 ALBUM COVER: "THE OUTLAW BLUES BAND"
As their name suggests, this was a blues-rock outfit from Los Angeles, California. They were one of the several new acts signed by Bob Thiele, an American record producer who worked on countless classic jazz albums and record labels such artists as John Coltrane, Louis Armstrong, Charles Mingus, Dizzy Gillespie, Gato Barbieri, Sonny Rollins and others for the ABC Record label. 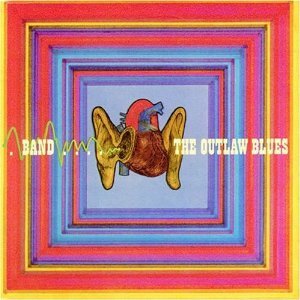 Their first album “The Outlaw Blues Band and the People” recorded in 1967; features lots of fluid guitar and you should enjoy this if blues-rock is your thing. Even if it isn’t, you might still like it. Certainly “Got To Have Peace On My Mind” is very imaginative with interesting sound effects and it extends far beyond the usual blues-rock format. The band also has strong jazz influences, particularly in the drumming and the sax-flute interludes. Other highlights include an interesting reinterpretation of John D. Loudermilk’s “Tobacco Road”, the instrumental “Death Dog of Doom”, “Tried to Be a Good Boy” and “Two ‘Tranes Running” (not a misspelling but homage to John Coltrane). This musical group was founded and directed by Victor Aleman who was born in El Salvador. He immigrated to Los Angeles, California in the early 1960’s and found his first artistic muse as the director and drummer for the Outlaw Blues Band. As the chief architect of their unique, groundbreaking sound, he recorded two albums for ABC Bluesway Records, released in 1968 and 1969. This first album was original recorded at United and Western Studios in Hollywood, California in 1967 for ABC Bluesway Records. Victor Aleman, Phillip John and Joe Francis had previously played with Rosie and The Originals (Angel Baby), in the early sixties. Joe Whiteman played with the Premiers (Farmer John and Duffy’s Blues). The musical sounds are in the roots of the blues: One of the only original American music, naked and pure. human-to-human heart transplant. That defiance was accepted by humanity, setting the new cultural ways that prevail up to the beginning of the 21st century. It changed our music.